0.0035" (3.5 mil) thick per side, pressure sensitive (7 mil total). These cold laminates are manually applied directly to the surface of printed PVC cards, providing added protection against reader abrasion and normal wear and tear. 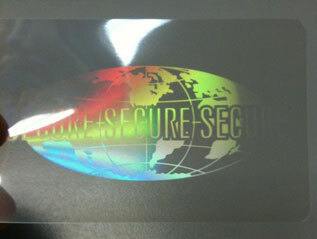 The overlay has an holographic image with a World Globe. Size is CR-79, slightly smaller than an regular CR-80 size, to prevent delamination.